Now before we get started; some of you may have memories of your ol’ Uncle Eddie the draft dodger sitting on the back porch with a cloud of herbal essence wafting around his pony tailed head or of a recent trip to British Columbia. But this ain’t that kind of story, so take this as a warning if any of you are granola-bark-straw munching folks (GBMF). 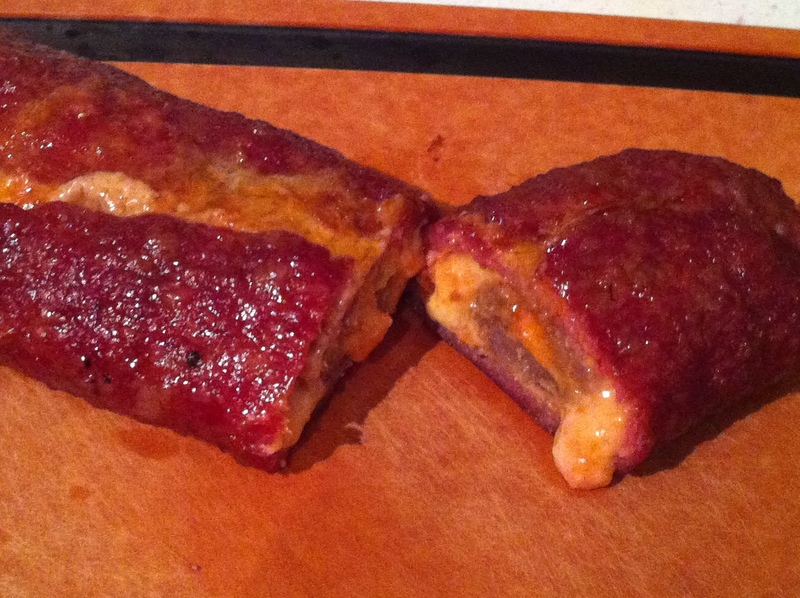 If you are one of those GBMFers, you won’t find this pretty; although you may find it secretly appetizing. These fatties are a carnivore’s delight. 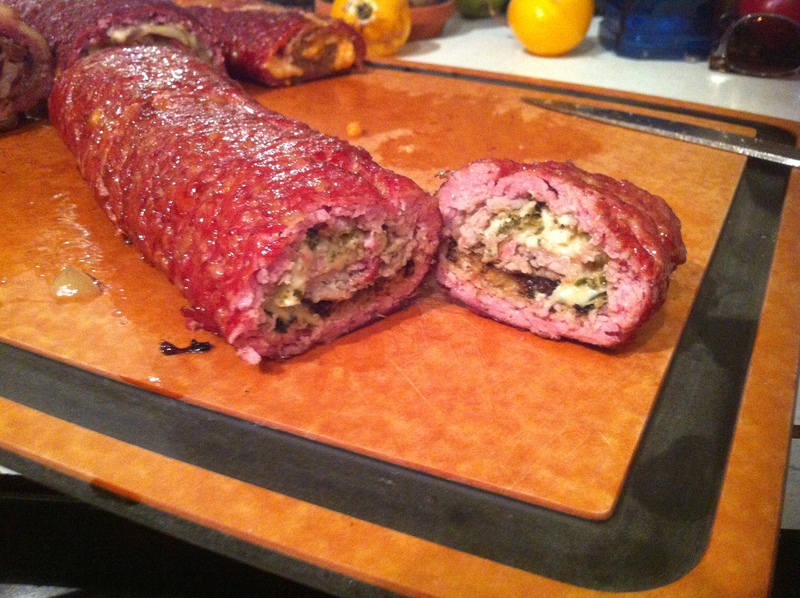 They are a layer of ground meat of your choice, such as sausage meat, ground pork, ground beef/lamb; heck maybe even ground tofu (doubtful) that is rolled around a filling of your choice; then sometimes wrapped in a lattice of bacon and then smoked at low heat until cooked to perfection. So, like most things I try, I jumped in with both feet and made some of each. In my humble novice opinion Fatties are the first quadrumvirate of the Chakras you must pass on the journey to smoking-barbequing Nirvana. To reach Nirvana you must pass through these points repeatedly; learning with each new passing until ultimate bliss has been achieved. Now on to today’s exploration. 1. Don’t get the filling too close to the edge or it won’t seal. 2. They may look pretty but they need lots of seasoning to balance out all of that meat surrounding the yummy filling. For this ‘Exploration with Sailor Rick’ I made a total of FIVE Fatties. 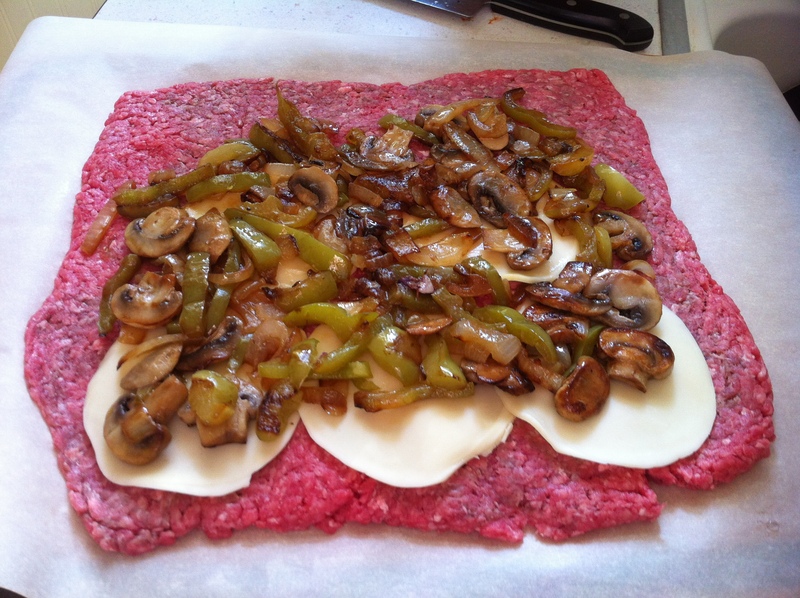 Fried onions, green peppers and mushrooms on ground beef with provolone. 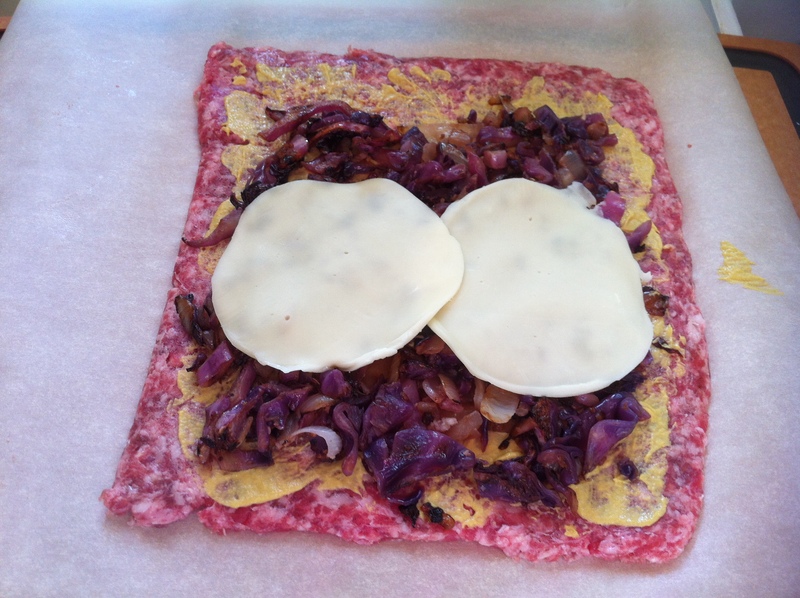 Fried red cabbage and onions on ground pork with provolone and a smear of German mustard on the meat. The whole thing wrapped in a bacon lattice. 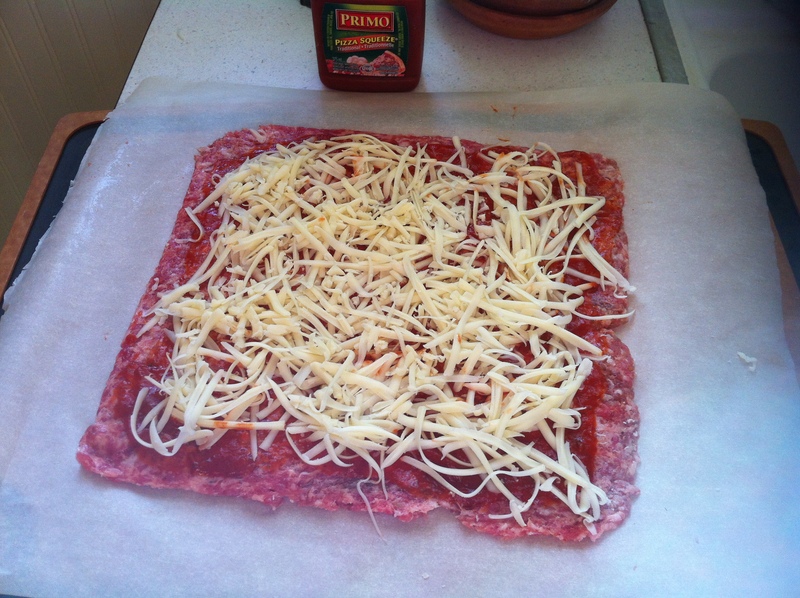 Pizza sauce and grated mozzarella on Italian sausage meat. 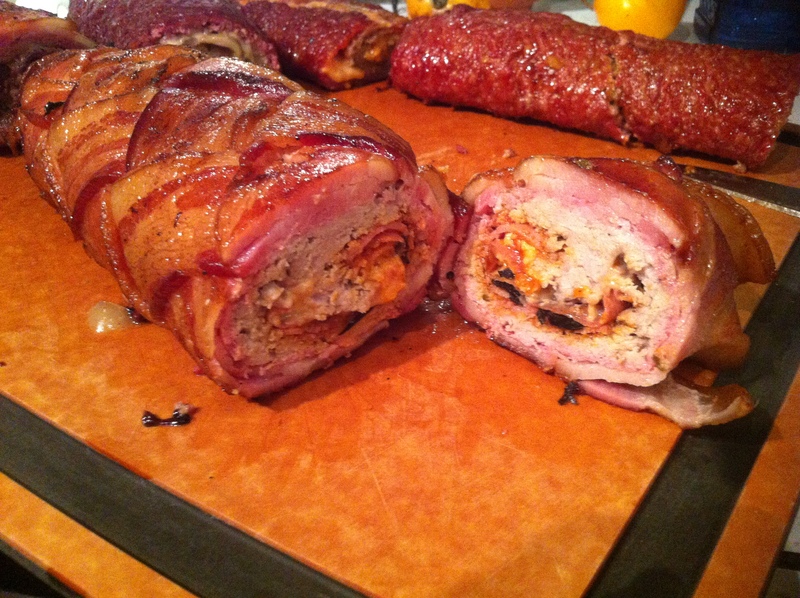 Pizza sauce, grated mozzarella, salami wrapped in Italian sausage and then wrapped in a bacon lattice. Oops forgot the filling picture! Fried eggplant, sundried tomatoes, provolone and a smear of basil pesto on ground lamb. 1. To get the meat flat place about 1 pound in a large Ziploc freezer bag. Roll with a rolling pin to fill the bag and to get an even layer. 2. Carefully cut open the bag and add the toppings remembering to keep them well away from the edges. 3. Carefully roll up like you would for a jelly roll or cinnamon buns and seal the edges. Optional – roll in a bacon lattice. 4. Place in a 200 deg F smoker with your favourite smoke and cook to an internal temperature of 160 deg F. Around 3 hours. 5. Remove from heat and rest for 10 minutes. Slice and enjoy. This was a fun exploration but next time I will make only a couple; 5 was way too many even for this meat eating family. Although I did get to make many a lunch to take to work.